Different referral systems models can be used, depending on the specific context and approach taken. Below are four examples. The first two can be used at the onset of an emergency—where the focus is on the provision of basic health and psychosocial care— and maintained during other phases of humanitarian response. The second two are more comprehensive and include security and legal/justice referrals. 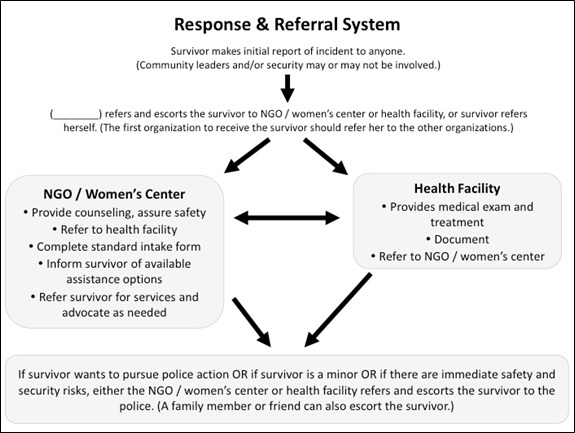 When choosing a model, it is important to remember that the goal is to address the immediate needs of the survivors and to choose a system that will provide 1) the survivor a safe and effective way of reporting that is based on her own preferences for care and treatment; and 2) a coordinated approach to service delivery. 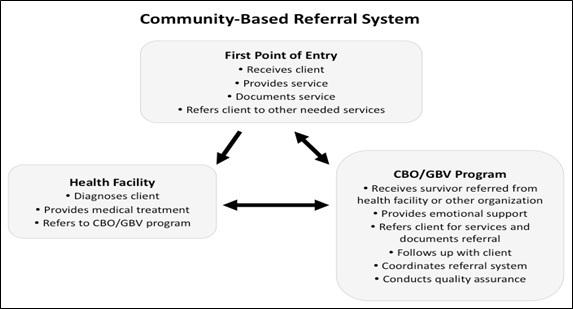 a. Community-based referral systems: In some settings, it may be more appropriate to have women’s groups serve as the central coordinating entity of a referral system. Volunteers from these women’s groups can be trained to act as psychosocial focal points who would then know about the services available in the community, how to access these services and when survivors should access these services in order to obtain the best quality care possible. 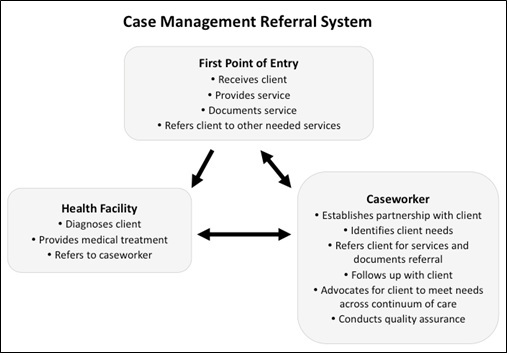 b. Case-management referral systems: Where case management services exist, caseworkers engage with survivors to assist them in defining their needs, deciding which options are best to meet those needs, and developing a plan for immediate support. Acting as advocates, caseworkers help survivors access care, monitor the provision of services, and follow-up with the survivor throughout the process. c. Incident reporting and referral standard model. 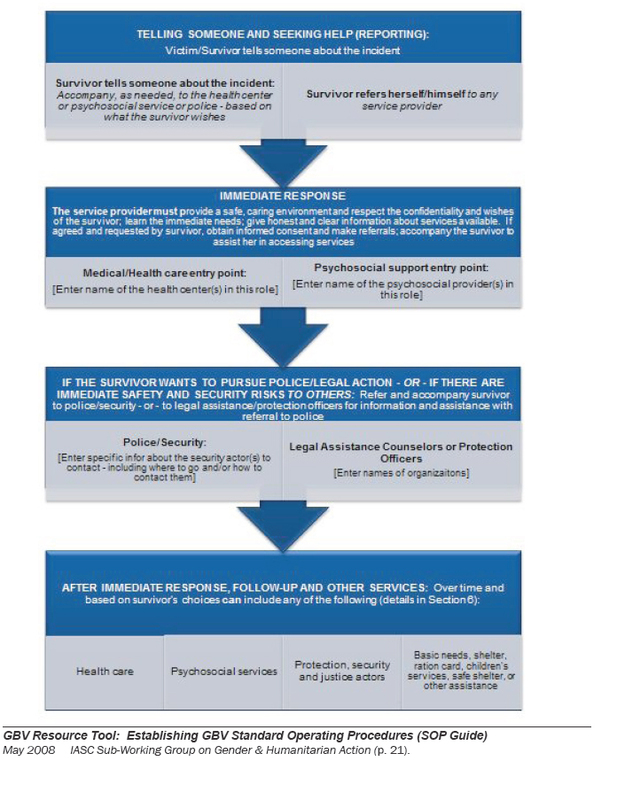 This model, developed by UNHCR and outlined within the IASC GBV Guidelines, is a more comprehensive model that may not be feasible at the onset of an emergency when community members have not been mobilized to support survivor-help seeking and/or the legal/justice and security systems are not able to reliably support survivors. It is important to remember–particularly in the acute response and the start-up phase of VAWG programming – that referral systems must be viewed from a response perspective and not from an incident reporting perspective alone. d. SOPs sample referral pathway. The SOPs referral pathway is more specific; it offers the opportunity to insert the names of various service providers into the referral pathway template. Additional examples of referral templates used in various settings are provided in the Handbook for Coordinating Gender-based Violence Interventions in Humanitarian Settings.